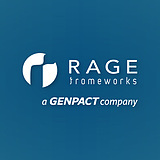 RAGE Frameworks Inc., a Genpact company, is a leader in knowledge-based automation technology and services providing AI for the Enterprise. RAGE-AI™ is a no-code patented platform for end-to-end automation of knowledge-based processes. RAGE-AI™ is currently used by some of the largest banks, manufacturers, consulting companies, high tech firms, and logistics companies. Headquartered in Dedham, Massachusetts with global operations centers in Pune and Belgaum, India, RAGE offers unprecedented speed, flexibility and insight in solving today’s most complex, critical business problems. Visit us at www.rageframeworks.com to learn more about RAGE AI™ and our entire suite of intelligent automation solutions and follow us on Twitter @RAGE_Frameworks.